Aim: To describe treatment outcomes and complications of selective intra-arterial chemotherapy (IAC) for retinoblastoma (RB) in Indian eyes. Materials and Methods: Single center, retrospective interventional case series of 6 eyes with RB who underwent IAC using Melphalan (3 mg/5 mg/7.5 mg) and topetecan (1 mg) (n = 4) or melphalan (3 mg/5 mg/7.5 mg) alone (n = 2) between December 2013 and June 2014. In all, 17 IAC procedures were performed using selective ophthalmic artery cannulation. 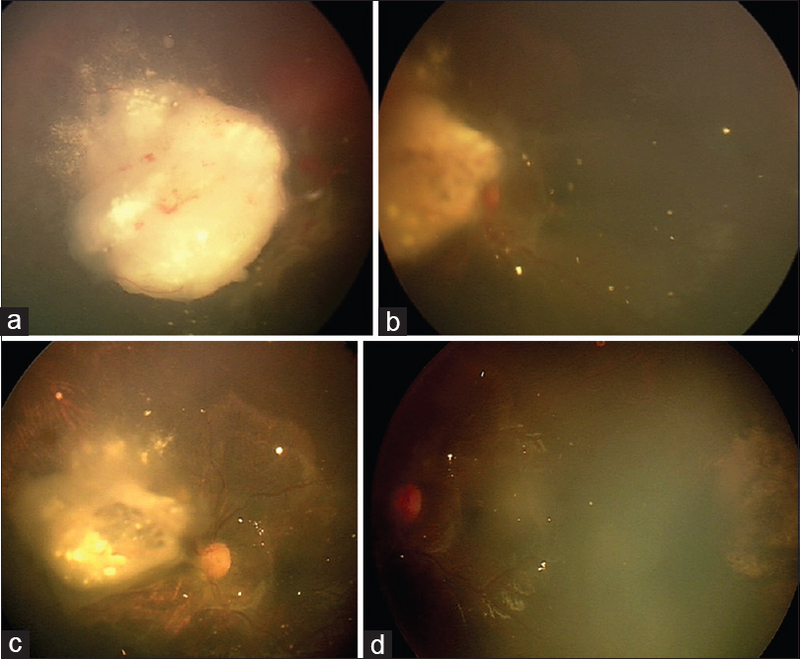 Treatment outcomes were evaluated in terms of tumor control, vitreous and subretinal seeds control and globe salvage rates. Results: IAC was employed as primary (n = 1) or secondary (n = 5) modality of treatment. Each eye received mean 3 IAC sessions (median: 3; range: 1-4 sessions). Eyes were classified according to international classification of RB as Group B (n = 1), C (n = 1), D (n = 2) and E (n = 2). Following IAC, complete regression of the main tumor was seen in 3 cases (50%), partial regression in 2 (33%), while 1 case (15%) showed no response. Of 4 eyes with subretinal seeds, 1 (25%) eye had complete regression while 3 (75%) eyes had partial regression. Of 5 eyes with vitreous seeds, 2 (40%) eyes had complete regression while 3 (60%) eyes had a partial response. Globe salvage was achieved in 5 of 6 eyes (83%). Diffuse choroidal atrophy and vitreous hemorrhage were observed in 1 (17%) eye, each. No hematologic toxicity or cerebro-vascular events were observed. Mean follow-up period was 5.5 months (median: 6 months, range: 1-6 months). Conclusion: IAC is an effective therapy for globe preservation in eyes with RB. Larger studies with longer follow-up are required to validate these results. In 2008, Abramson et al. used a similar but slightly more direct technique to cannulate specifically into the ophthalmic artery for chemotherapy infusion without the need for distal balloon occlusion of the internal carotid artery. In 2011, Gobin et al. reported their results with selective catheterization of the ophthalmic artery and injection of melphalan in 95 eyes with unilateral RB. The Kaplan-Meier estimates of ocular event-free survival rates at 2 years in their study were 70.0% (95% confidence interval = 57.9-82.2%) for all eyes. They concluded by saying that IAC is safe and effective in the treatment of advanced intraocular RB. More recently, Shields et al. reported their outcomes of IAC for RB in 70 eyes. In their study, globe salvage was achieved in 72% of primary-treated cases and in 62% of secondary-treated cases. Specifically, primary therapy achieved globe salvage for Group B (100%), Group C (100%), Group D (94%), and Group E (36%). This study was a retrospective, nonrandomized, interventional case series. The medical records of all patients with RB treated with IAC at the Oncology Service between December 2013 and June 2014 were reviewed. Six eyes of 6 patients with RB who underwent IAC using melphalan (3 mg/5 mg/7.5 mg) plus topotecan (1 mg) (n = 4) or melphalan (3 mg/5 mg/7.5 mg) alone (n = 2) were included. The IAC catheterization procedure was performed by the interventional radiologist in the operating room under general anesthesia. Institutional review board approval was sought for this study. The patient data were reviewed for the demographic association, clinical findings, management, complications, and outcomes. All prior treatments to the eye and prior systemic or local chemotherapy were recorded. A comprehensive ocular examination under anesthesia was performed with assessment for laterality, tumor growth pattern, total number of tumors per eye, international classification of RB, Reese-Ellsworth classification, intraocular pressure (Schiotz tonometer), and status of anterior and posterior chamber involvement with RB or associated features. All patients had magnetic resonance imaging imaging (MRI) scan done at 6 months interval during the course of treatment. Complete blood counts and basic coagulation tests were done at baseline and blood counts repeated 2 weeks after every IAC. Each tumor was measured for greatest basal diameter and thickness, proximity to the Optic nerve and foveola (mm), associated retinal detachment (percent, 0-100%), subretinal tumor seeds (absent/present) and vitreous tumor seeds (absent/present). Intra-operative examinations were documented with fundus drawing, fundus photography with RetCam camera (Massey Industries, Dublin, CA, USA) and ultrasonography. Pros and cons of IAC were discussed with the family, and a signed informed consent was obtained. After the parent or legal guardian had consented, the IAC catheterization procedure was performed by the interventional radiologist in the operating room under general anesthesia. Intravenous heparin (75 IU/kg) was used for anticoagulation. The groin area was prepared, draped and a 4-French arterial sheath was placed into the femoral artery region. Under fluoroscopic guidance, the French (1.3-mm-diameter) catheter was guided into the ipsilateral internal carotid artery. Serial arteriograms helped visualize the eye and cerebral vasculature so as to select the best approach, showing the path of the ophthalmic artery from the internal carotid artery. 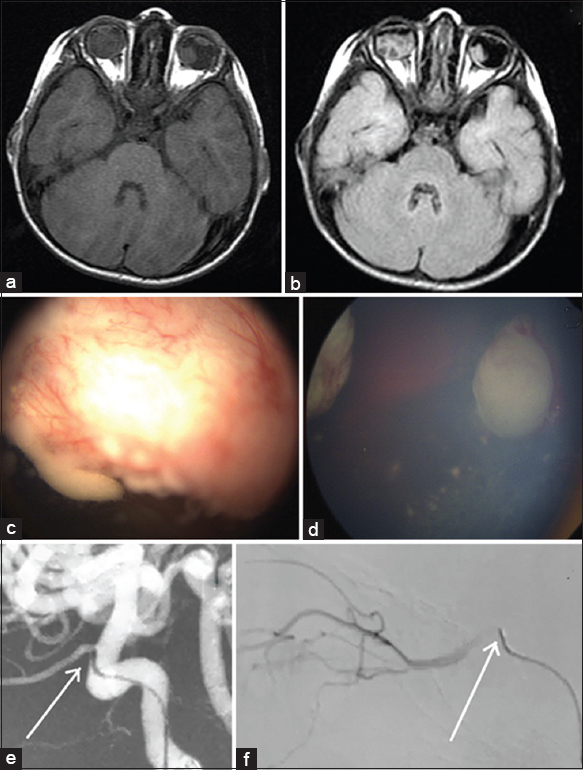 The ipsilateral proximal portion of the ophthalmic artery was catheterized with a 450-μm microcatheter using fluoroscopy and road mapping, and a confirmatory angiogram was taken. Chemotherapeutic agents were diluted in 30 mL of saline and delivered using a pulsatile, nonlaminated technique over 30 min to maximize homogeneous drug delivery. Chemotherapeutic agents used were melphalan (3 mg/5 mg/7.5 mg) and topotecan (1 mg). The choice of drugs was influenced by patient age, size of tumor and presence of vitreous seeds (VS). As a protocol, we plan 3 cycles of melphalan in all cases. A dose of 3 mg is considered for tumors of Group B, C, or small D. A dose of 5 mg is used for most Group D and E eyes. A dose of 7.5 mg is used if tumor activity persists following treatment with 5 mg melphalan. Topotecan 1 mg is used in cases with extensive VS or if there isn't a good response with melphalan alone. At conclusion of the infusion, the catheters were withdrawn, the femoral sheath was removed, and hemostasis of the femoral artery was achieved by manual compression. The child was observed for 6 hours and discharged the same day. A sterile dressing over the cannulation wound was maintained for 2 days and treated with topical antibiotic ointment. The same standard technique was followed throughout the study period. Patients were followed-up at 1 monthly intervals and IAC repeated as necessary. The globe was assessed for patency of vascular flow to the eye including the central carotid artery, internal carotid artery, ophthalmic artery, central retinal artery, branch retinal artery, retinal veinous drainage and choroidal vascular bed. The fundus was evaluated for the status of the retina, retinal pigment epithelium and optic nerve. New or preexisting neovascularization of the iris with/without neovascular glaucoma was recorded. Treatment outcomes were evaluated in terms of tumor control, vitreous and subretinal seeds control and globe salvage rates. Treatment complications were noted. The average age at treatment was 25 months (median: 20, range: 12-44 months). The condition was bilateral in 5 cases [Figure 1]. There were 4 male and 2 female patients. One patient had familial RB while the other 5 had sporadic occurrence of RB. Patient demographics, disease characteristics at baseline, and prior treatment details are provided in [Table 1]. Patients presented with leukocoria (n = 4), strabismus (n = 2) or eye redness (n = 1). Average duration of symptoms at presentation was 17 weeks (median: 1, range: 1-48 weeks). Eyes with RB were classified according to the international classification of RB as Group B (n = 1), C (n = 1), D (n = 2) and E (n = 2). According to Reese-Ellsworth classification, eyes were classified as 4a (n = 1) and 5b (n = 5). The mean tumor base was 12.8 mm (median: 12.8, range: 6-18 mm) and the mean tumor thickness was 6.4 mm (median: 5.5, range: 2.6-14 mm). VS were present in 5 eyes involving two quadrants (n = 1), three quadrants (n = 2) or all four quadrants (n = 2). Subretinal seeds (SRS) were present in 4 eyes involving two quadrants (n = 2), three quadrants (n = 1) or all four quadrants (n = 1). Optic nerve was visible in 3 eyes, and obscured by tumor overhang in the other three eyes. Secondary retinal detachment was present in 1 eye. The number of tumors per eye ranged from 1 (n = 3), 2 (n = 1), 4 (n = 1) or 5 (n = 1). Mean proximity of tumor to optic disc was 1 mm (median: 1, range: 0-3 mm). Mean proximity of the tumor to foveola was 1 mm (median: 1, range: 0-4 mm). All eyes had tumors that were predominantly endophytic. Intra-arterial chemotherapy was employed as primary (n = 1) or secondary (n = 5) modality of systemic treatment. Patient selection was influenced by the progression of disease despite earlier treatment and status of fellow eye. Totally, 5 of 6 patients had bilateral RB-fellow eye of 4 patients was enucleated for Group E tumor, and 1 patient had Group A tumor in fellow eye that regressed with focal treatment [Table 1]. One case had unilateral RB that progressed despite treatment. So, the progression of disease despite treatment led to considering IAC for globe salvage in 5 of 6 eyes. One patient opted for IAC as "primary" therapy (case 6), where fellow eye was enucleated for Group E tumor. Of the 5 patients that had secondary IAC, prior systemic treatments included conventional intravenous chemotherapy alone (n = 4) or in combination with external radiation therapy (n = 1). Likewise, ocular treatments included cryotherapy (n = 5) and transpupillary thermotherapy (n = 3). Each eye received a mean of 3 IAC sessions per eye (median: 3; range: 1-4 sessions). Treatment details, complications and outcomes are summarized in [Table 2]. Following IAC, complete regression of the main tumor was seen in 3 cases (50%) [Figure 2], partial regression was seen in 2 (33%) while 1 case (15%) showed no response to therapy. Globe salvage was possible in 5 of 6 (83%) eyes and one eye underwent enucleation due to dense vitreous hemorrhage during the course of treatment (case 1). Histopathologic examination revealed poorly differentiated RB with choroidal invasion more than 3 mm. This constituted a metastatic risk factor, and the child underwent 6 cycles of adjuvant chemotherapy. Of 4 eyes with SRS, 1 (25%) eye had complete regression while 3 (75%) eyes had partial regression. Of 5 eyes with VS, 2 (40%) eyes had complete regression while 3 (60%) eyes had a partial response. Globe salvage was achieved in 5 of 6 eyes (83%). Diffuse choroidal atrophy and vitreous hemorrhage was observed in 1 eye, each. No vascular occlusion or hypotony was noted in any eye. No hematologic toxicity, cerebro-vascular events, systemic metastasis or death were observed. Mean follow-up period was 5.5 months (median: 6 months, range: 1-6 months). In our series, 4 of 6 cases (Group D = 2, Group E = 2) were advanced RB. The success rate for regression of Group E tumors with IAC has been reported to be 36%. The staging of tumor at baseline has a significant bearing on the overall outcomes. In our series, most (5 of 6) cases had IAC as a salvage treatment following failed conventional chemotherapy. It has been previously observed that primary IAC has far better outcomes in term of globe salvage, tumor control and functional outcomes as compared to secondary IAC. The only case that had primary IAC for Group D RB had complete regression of the tumor with 3 cycles of IAC. This is an important factor determining the outcomes in such eyes. Probably with a greater risk-acceptance of IAC among parents and better affordability of the procedure, a larger cohort of eyes with "primary IAC" and a longer follow-up could show better results in the future. The limitations of this study include the small cohort of 6 treated eyes and relatively short follow-up of mean 6 months. We anticipate that longer follow-up will provide more information regarding lasting tumor response. However, at least in the short-term, this technique appears favorable for Group B, C and D eyes. Even though IAC for RB is technically challenging, skill-intensive and a costly procedure, it is a precise and effective technique that helps in reducing the dosage of chemotherapeutic agents required for regression of RB and is an effective therapy for globe preservation. Carol L Shields, MD for her invaluable inputs and guidance. Kiribuchi M. Retrograde infusion of anti-cancer drugs to ophthalmic artery for intraocular malignant tumors. Nihon Ganka Gakkai Zasshi 1966;70:1829-33. Kaneko A, Ise T, Oohira M. Chemothermotherapy was successful in two cases of recurrence of intraocular retinoblastoma after irradiation. Jpn J Ophthalmol Clin Ophthalmol 1990;44:289-92. Suzuki S, Kaneko A. Management of intraocular retinoblastoma and ocular prognosis. Int J Clin Oncol 2004;9:1-6. Abramson DH, Dunkel IJ, Brodie SE, Kim JW, Gobin YP. A phase I/II study of direct intraarterial (ophthalmic artery) chemotherapy with melphalan for intraocular retinoblastoma initial results. Ophthalmology 2008;115:1398-404, 14041. De Francesco S, Pichi F, Lembo A, Mastrangelo D, Paradiso A, De Luca M, et al. Massive anterior chamber involvement after intra-arterial chemotherapy for retinoblastoma: Ultrasound biomicroscopy and histopathology. Int Ophthalmol 2014;34:967-70.